How Much Should I Feed My Puppy? is a question I’ve heard many times before, but now it’s my turn. It’s easy to follow the chart on the side of your dog food bag or follow the directions given to you by the Guide Dogs of America Training Department. However, what happens when you follow the feeding schedules and your dog appears too be too skinny or too fat. 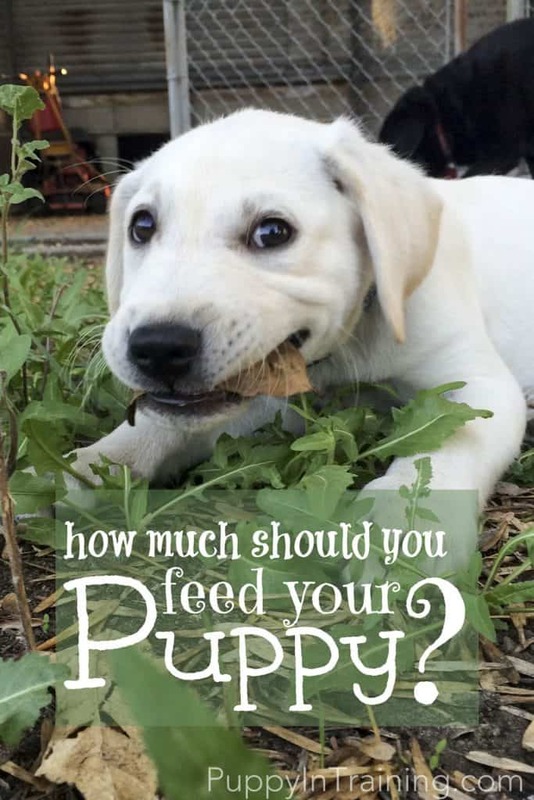 How much to feed a puppy will definitely vary depending on many different items including the size of your puppy, breed, amount of exercise, the type of food you give, the age, and many other factors. Just like people every puppy is different. I remember growing up I couldn’t put on weight for the life of me. I had friends who struggled to find the right balance between food and exercise and couldn’t keep off the pounds. Ahhh…how the tables have turned now I’m fighting to keep the pounds off. Yesterday we were lucky enough to get a visit from the Kennel Manager at Guide Dogs of America. She was kind enough to answer many of our questions regarding the kennels and other miscellaneous guide dog questions. One thing that she talked about was the importance of letting the kennel know exactly how much and when your puppy is eating. She also talked a little about overweight puppies and how their feeding schedules might need to be changed. Of course an overweight puppy may be the result of overfeeding, giving too many treats, or lack of exercise. I was busy with Derby and had one eye and one ear on him and nearly forgot to ask our group about his feeding schedule. Derby is on the skinny side (think more greyhound less labrador) and I wanted to find out if I should be feeding him more food. As I’ve always said one of the great things about being a part of the Guide Dog group is you have a resource of people who have many experiences with dogs. I always feel confident in asking any question I have to any member of the group. I received several opinions on increasing Derby’s food intake. Everyone did agree that he looks a little thin. I’m also lucky enough that I can make a comparison to his two siblings, Dutch and Dexter. Compared to Dutch and Dexter Derby is definitely a skinny dude. Derby sitting in his crate. Does he look a little thin to you? He’s definitely long. That’s Stetson’s crate he’s sitting in. 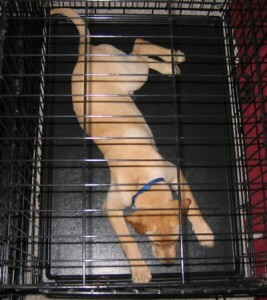 He’s already the length of the crate! Derby’s current feeding schedule is 3/4 of a cup 3 times a day. As of this morning I decided to increase his food to 1 cup in the morning, 3/4 cup in the afternoon, and 3/4 of a cup in the evening. I was thinking about increasing a little more, but Derby always seems to get a mouthful of Linus’s food a couple times a day which probably contributes an extra 1/4 cup. We’ll see how it goes for the next week or two. If Derby is still looking on the thin side then maybe we’ll try increasing his evening meal to 1 full cup. If you’re interested in feeding schedules for your dog check out this article: Puppy Feeding Schedules. Stetson is starting to get a little heavy…I’d say borderline obese. Now I’m not just asking How Much Should I Feed My Puppy? but instead how much should I feed a dog? QUICK RECOMMENDATION: Just in case you were wondering back in the Derby days we fed our pup’s Natural Balance Dog Food. Today we are feeding all of our pup’s Wellness Core Puppy Food. QUICK TIP: Moving forward we plan on putting our pup’s on a food rotation that will include dehydrated, wet, dry, and possibly raw dog food. Stay tuned for updates on our thoughts and practices for feeding your puppy. When our puppies are about 4-5 months old we go from feeding them 3 times a day to 2 times a day. However, this is based on rules set by the guide and service dog schools we work with. You might consult your vet to see what he/she recommends for your puppy. Yep, it’s always good to see a waistline especially with Labs who always act like they’re starving. In our experience the Lab pups we’ve brought home have needed more rather than less kibble compared to the guidelines in our puppy manual. I’m guessing it’s their high energy level and the amount of activity we do with our pups on a daily basis. My lab puppy is 3 months and 2 weeks old. I feed her 1 12 cup, 3 times a day. She eats the ‘Taste of the Wild-Pacific Stream’. However during my last purchase of food, I mistakenly ordered adult dog food, instead of the puppy food. I compared the nutrient level and the adult food has 25% protein as 27% in the puppy food. The remaining items are almost the same. Would there be any harm in giving her adult food? You should check with your vet, but in general we feed our puppies puppy food until they are around 1 year old. If it were me I’d either return the adult food or check the expiration date and as long as it’s still good feed it to my puppy when she gets older. Hi Colby, my 3 months puppy doesn’t eat much, should I take him to the vet? How do you measure the amount of puppy chow you feed your puppy in training? When you feed a puppy, do you measure 3/4 cup of puppy chow before it is soaked, or 3/4 cup after it is soaked? If I measure 3/4 cup before soaking and it becomes almost 3 cups.